Check the settings on your thermostat. Make sure the temperature control selector is set above the current room temperature, and the system switch is on the HEAT or AUTO position. 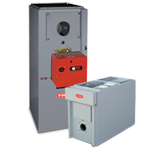 The fan switch should be set to ON for continuous airflow or AUTO if you want the blower to operate only while the furnace is operating. Try to get the furnace to turn on by raising the thermostat to its highest temperature setting. Check the power disconnect switch by the furnace. Check the fuse/breaker at the electrical panel for the furnace. Check to make sure you have fuel oil. We provide Heating, Cooling, Furnace & Air Conditioning Installation, Repair & Maintenance in Broomall, PA and the surrounding area.